You know that you are heading to somewhere rather hip when the name is missing vowels! I have to admit to feeling rather apprehensive that the place would be too trendy, too noisy, and too young for us! DSTRKT is located in between Leicester Square and Piccadilly Circus in a very busy part of London. The door to the right is the entry to the nightclub, the door to the left the entry to the restaurant. The night we went London was as packed as ever (can someone please explain to me the attraction of the M&M store? Nearly every other person seemed to be carrying a carrier bag from there). So it was a relief to slip downstairs away from all the hustle and bustle. 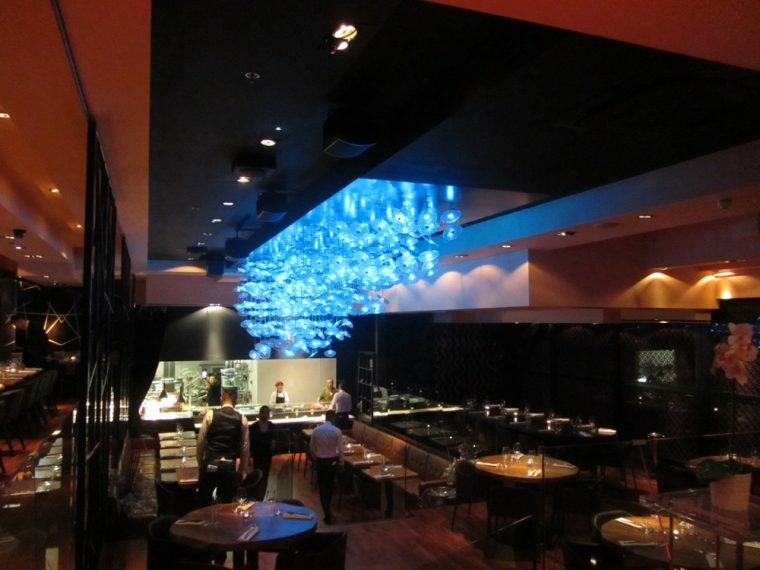 The restaurant does have a nightclub feel to the decor, it’s quite dark but warm in tone, I have to say that I was rather taken with the blue glass lights hanging over the central space. Dstrkt restaurant seems to cover quite a lot of bases; providing pre-theatre dining as well as late night dining and bar food for the clubbers, opening from 5 p.m. until 2 a.m. It’s certainly somewhere that seems to attract people on date nights or dates wanting to impress their date. The open kitchen which displayed the chefs at work, certainly helped to give the impression that this is somewhere a little bit special. 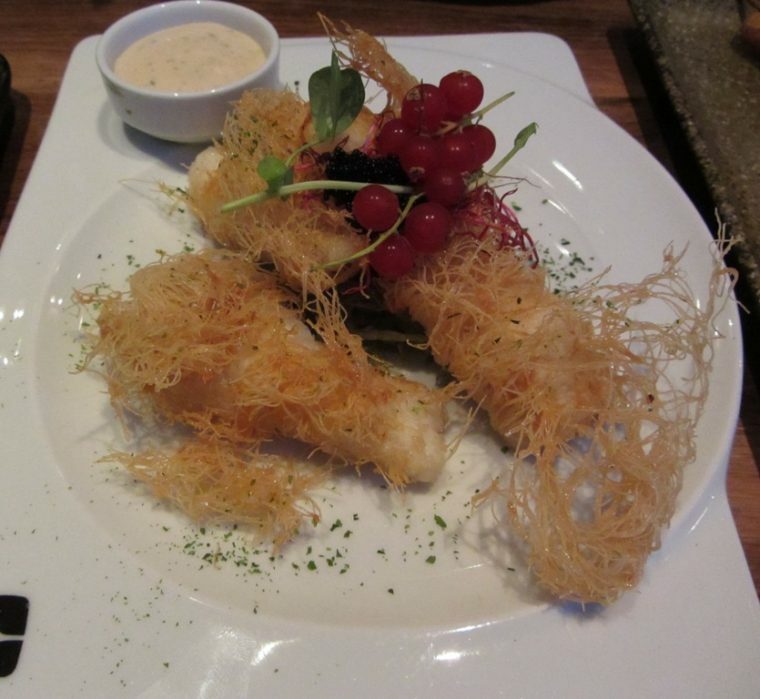 The menu is a mixture of Far Eastern and modern European, giving the option to mix and match between courses. 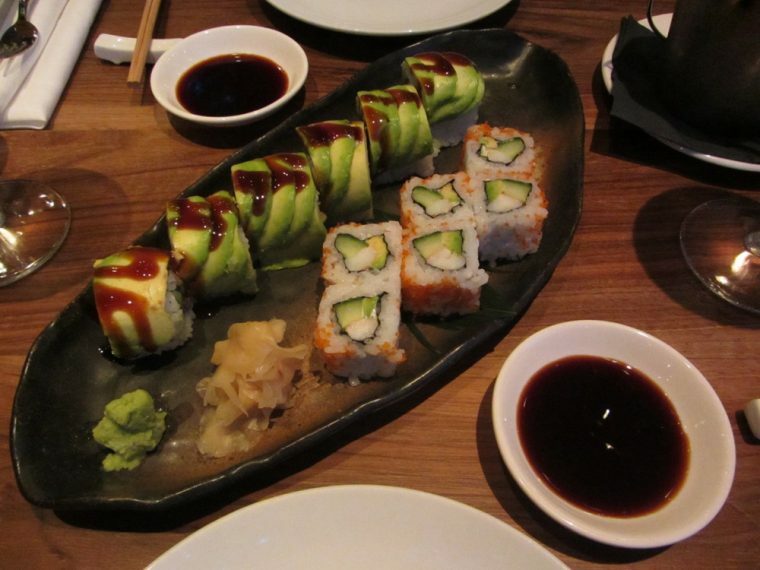 To start with we were presented with a mixed plate of sushi, California rolls (£10 for 6) and Salmon and avocado served with a delicious bbq sauce (£9.50 for 6). If this had been a lunchtime I’d have been quite happy pausing there! 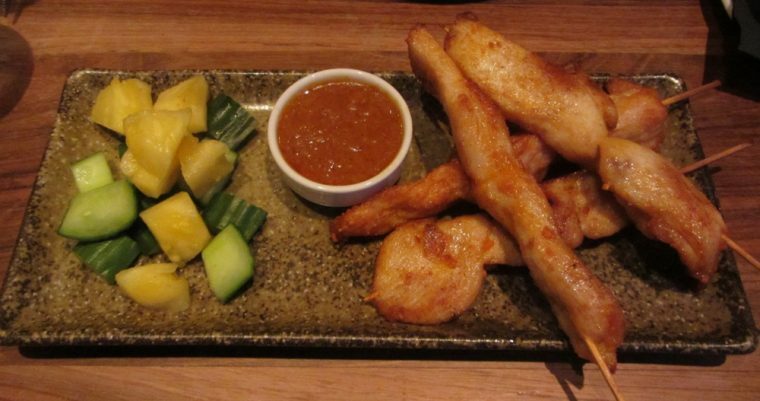 We continued with a chicken satay (£11), the chicken served still beautifully moist, with the traditional peanut sauce served with cucumber and pineapple chunks (I was less certain about these with the chicken). We then changed tack and were presented with two fish dishes from the modern European section of the menu. One dish was pan-fried sea bass, and the other cod topped with crispy potato (I could be wrong, as I can’t find this dish listed on their website). I wasn’t sure that the kumquat was going to work with the seabass, but it’s sharpness cut through the fried skin beautifully. I was struggling by this point! Alex gamely continued with a fluffy and light cheesecake. I helped out by eating some of the fruit! 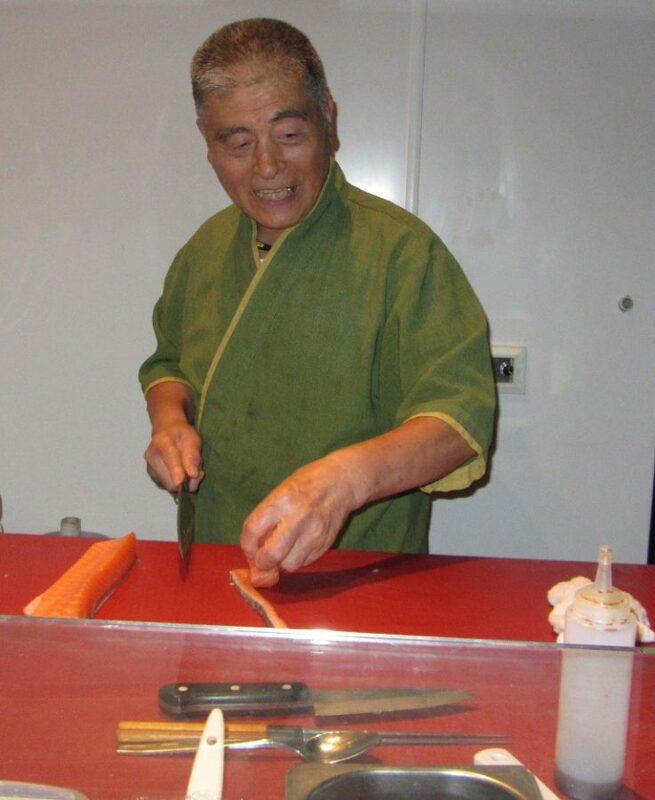 Throughout the meal, we received attentive and knowledgeable service. 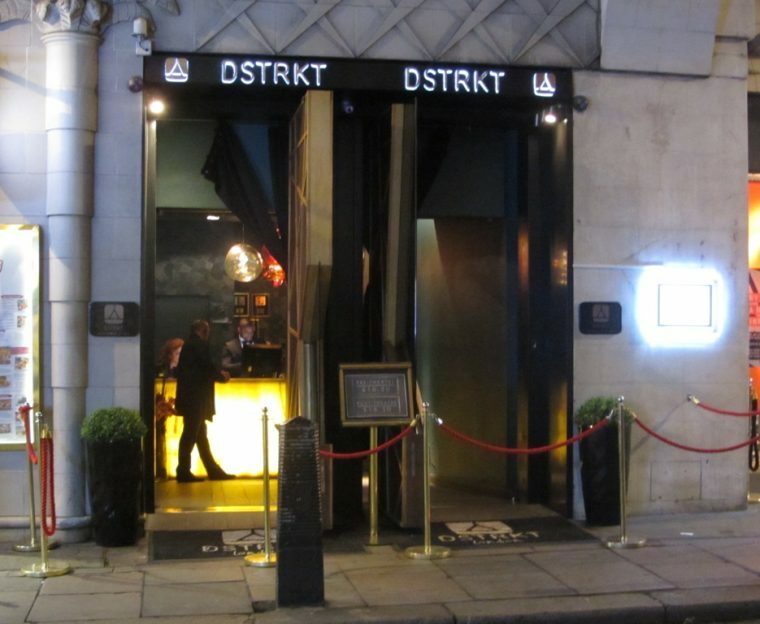 Whilst I don’t think I’d want to take the nightclub door (and might not make it past the doorman’s scrutiny), I will consider DSTRKT as a pre or post theatre dining option. At the moment these menus are available via OpenTable on weeknights priced at £21 for 3 courses, including a glass of Prosecco; somewhat of a bargain given the quality of everything we experienced.